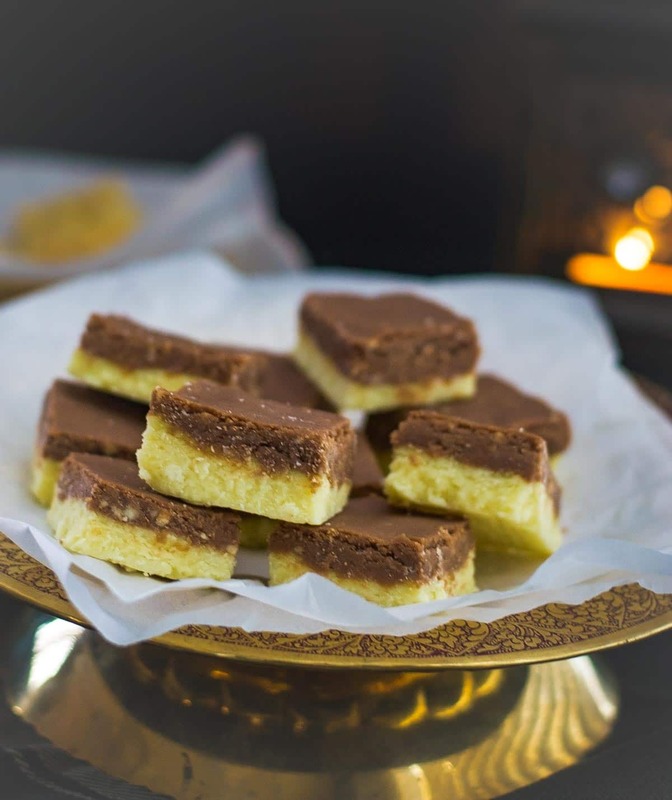 This 2 layered Chocolate Barfi recipe is sure to steal your heart. 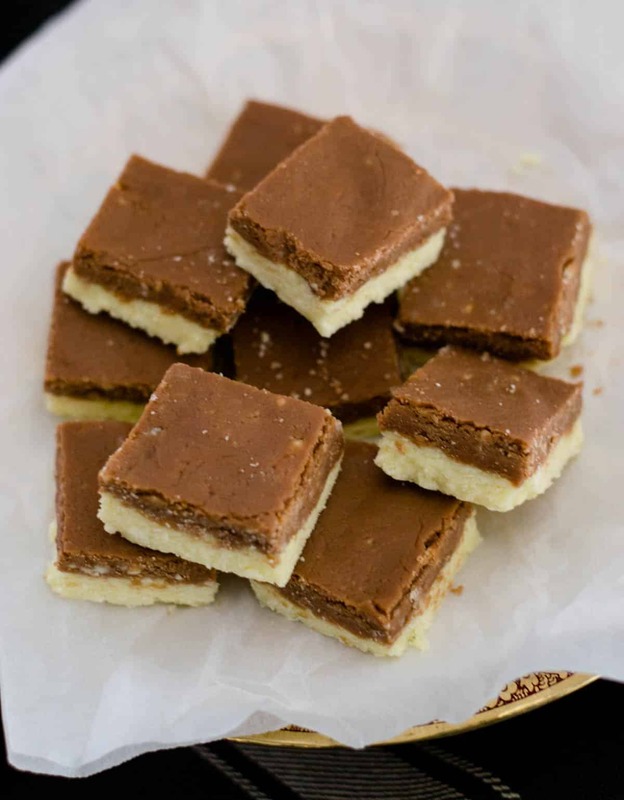 Follow this fail-proof and easy recipe to make this Chocolate Barfi in a microwave. The one thing that hasn’t changed about me since childhood is my love for Chocolate Barfi. Who can resist this addictive combination of milk and chocolate, right? 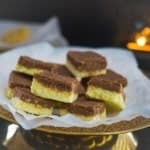 There are plenty of Chocolate Barfi recipes on the internet that will teach you how to make Chocolate Barfi with milk powder in a microwave. While they are easy enough,it fails to take into consideration that not all milk powders are made equal. So it is quite possible that you will end up with a Chocolate Barfi that refuses to set and ends up in a gooey mess. How is this recipe different ? I understand that with most recipes, you follow instructions to a T and you will get it right. But making Chocolate Barfi can get a bit tricky if you don’t use the right amount of milk powder depending on the quality or variety of the milk powder.Not all milk powders are created equal, so don’t just dump the milk powder as per the recipe states. Instead follow the guidelines below. Milk Powder – The milk powder must be fine to get a smooth texture. For the ones living in the US, do NOT get the store brand. Buy Bob’s Red Mill Milk Powder. They are far superior in taste and have the fine texture that is required for this recipe. If you don’t live in the US, I think the Nestle Brand of Milk powder should work as well as it is a fine powder. Dough texture – In the recipe, I have given you a range for the milk powder and not the exact measure. This is for a reason. You are going to making a dough for this recipe, so use only as much milk powder as you need. The mixture should be just about moist and not liquidized. 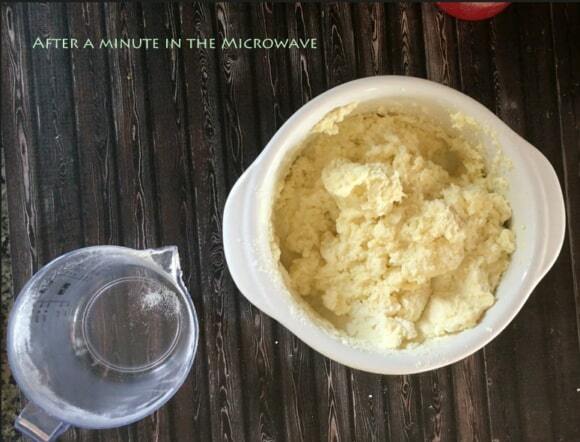 To a deep microwave-safe bowl, add 2 cups of milk powder, whipping cream, and confectioners sugar. Whisk them well making sure they are well blended. 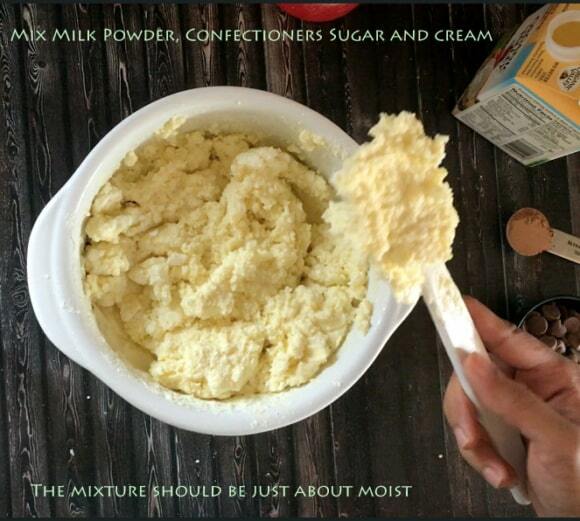 Add the remaining milk powder spoon by spoon till you have a mixture that is just about moist. It should NOT be liquidy. Having lumps is okay. 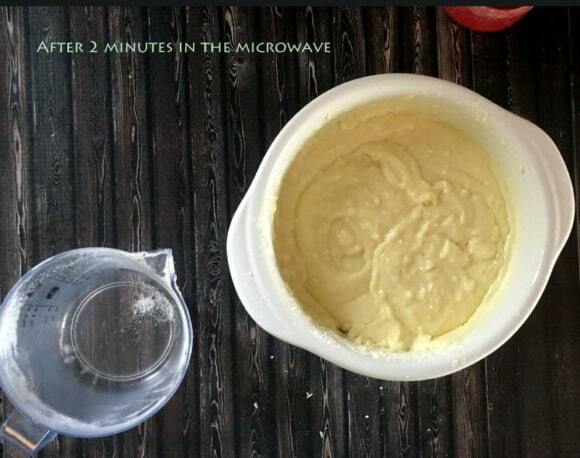 Place the bowl in the microwave and cook for a minute, take the bowl out and mix well to get rid of the lumps. Repeat this process three more times to bring the total cooking time to 4 minutes.At this point, the mixture should be coming together like a dough (the texture should be like play-doh). If the dough is too hot to handle, wait for a minute or two. 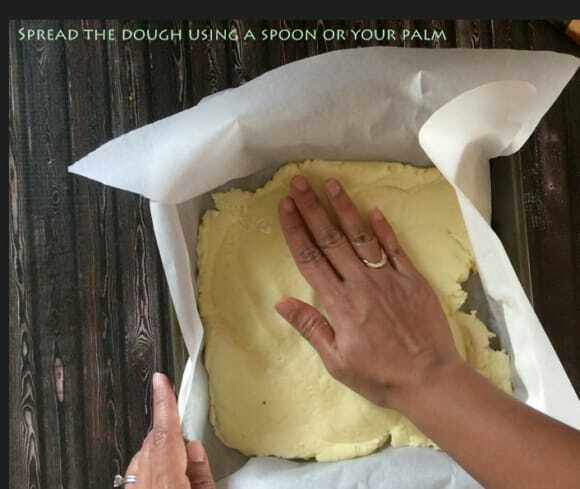 Grease your hands with ghee and knead it for a couple of minutes to get a soft textured dough. Line a 9-inch square baking pan with wax paper or grease it. 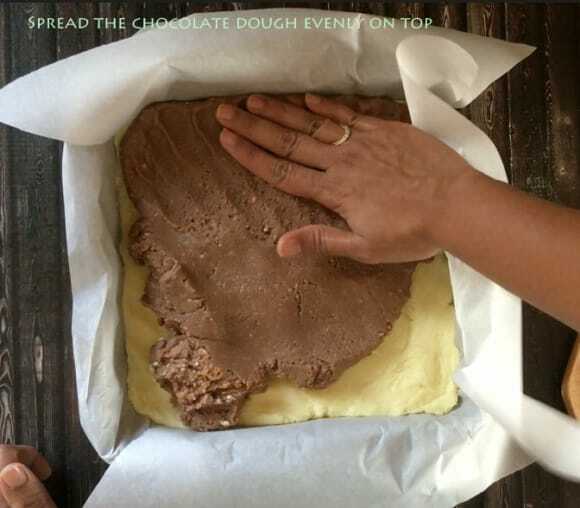 Add 1/2 of the dough to this pan and level the dough using the back of a spoon, a bowl or your palm. 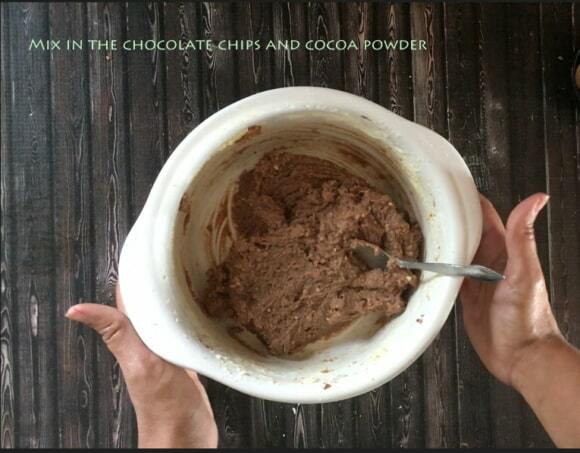 Add cocoa powder and chocolate chips to the remaining dough, microwave it for 30 seconds. 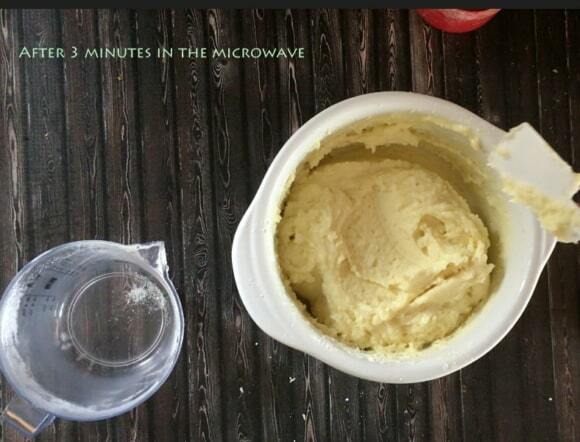 Remove from microwave and mix well with a spoon. 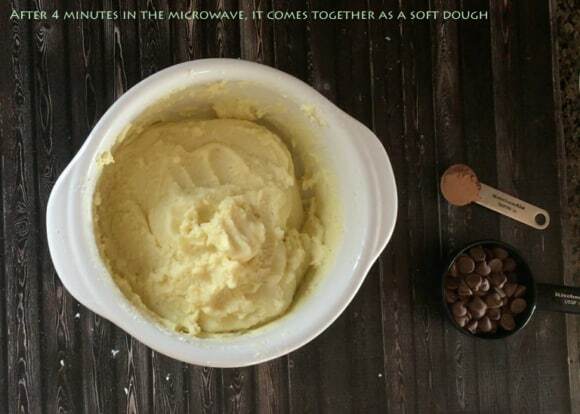 Add the chocolate dough on top of the white dough and spread it evenly so as to completely cover the white dough. Refrigerate the mixture for 10 minutes and allow the chocolate barfi to set. Cut the barfi into the desired shape (square or diamond) and serve at room temperature. Store the remaining pieces in the refrigerator. If you loved this recipe, check out these easy recipes to make Rava laddoo, Wheat laddoo, and Besan Laddoo.